Since March, 2004, she worked as an administrative personal assistant to Masaru Emoto who was the researcher and missionary of water as well as author of world best-seller “The Message from Water”, “The Hidden Messages in Water”, “The True Power of Water”, etc. 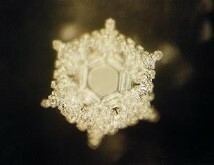 Registered, with Masaru Emoto, Non-Profit Organization EMOTO PEACE PROJECT in Japan in order to make the earth a harmonious and peaceful place based on “Love and Gratitude” by educating people, especially children, the truth of water by distributing 650 million copies of free picture book, THE MESSAGE FROM WATER, to all children around the world. Succeeded the EMOTO PEACE PROECT from Masaru Emoto when he passed away in October, 2014 and continues to work for peace on earth with “The Message from Water” as the Ambassador of the EMOTO PEACE PROJECT. She gives presentations and seminars in English and Spanish around the world on Dr. Emoto’s revolutionary discovery on water which is deeply connected to our individual and collective consciousness. In her presentation, she shows many water crystals that Dr. Emoto used to use in his presentations and speak to people’s heart that water shows in its crystal that “Love and Gratitude” is the most beautiful energy which can make the whole world a peaceful place.